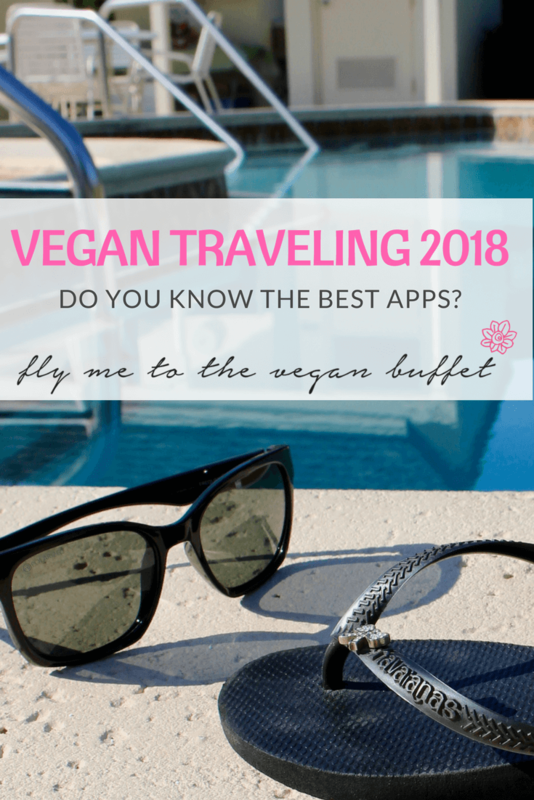 VEGAN TRAVELING IN 2018: DO YOU KNOW THESE APPS? Where can I get food, what do restaurant chains or airports offer? Which drinks are vegan? 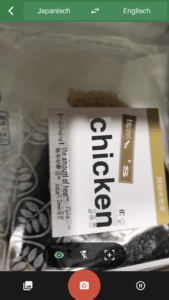 What can I snack on? Where do I take my omnis and make everyone happy, including me? 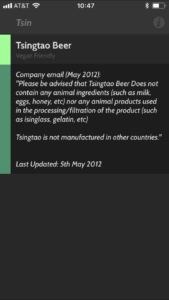 How do I order despite the language barrier, or read ingredients in a foreign language or take a local cooking class? Where do I find a “green” hotel, where can I shop for clothes or go to the hairdresser and feel good about it? These apps offer a lot of solutions. 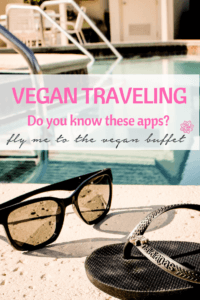 Traveling as a vegan doesn’t have to be exhausting, in fact, with these apps, it’s fun! The classic. HappyCow has been around since 1999 and has an extensive worldwide collection of food sources. 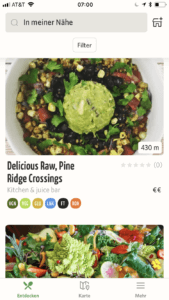 Users can add and rate places and save favourites. There also is a free website version, a facebook page, a YouTube channel and a cookbook. The app isn’t free, but totally worth the cost in my opinion. Whether I went out on my own and checked out vegan places or took my omnis to a vegan-friendly omni-place that everyone enjoyed, we often ended up discovering more alternative areas with interesting shops, nice people and cool nightlife away from the usual tourist paths. If you hit “directions” and “open in apple maps”, the map opens, works offline as well and makes it easy to find places. It is a good idea to check in advance if the place still exists, the opening hours are still correct, you can make a reservation, if there actually is vegan food at any time etc. Unfortunately these things can change very suddenly. There were times when I found the places to be closed for various reasons, or I couldn’t find them at all or they only offer a vegan option in the evening (in countries with non-existent breakfast culture) and wondered why I didn’t just ask the hotel concierge to call the place? It can also be a good idea to read other users’ reviews before – or write one yourself to help keep the information up to date. This app is good and keeps getting better. I found a nice YouTube tutorial on how the app works and it’s many features here. 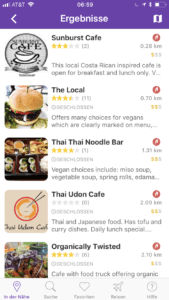 Highly recommended counterpart to HappyCow from Germany, and a good addition, because both apps often list different places and Vanilla Bean offers more filters: gluten free, raw, organic, regional, etc. This app started 3 years ago and launched in the US in January 2018 – and has been catching up at high speed. Every listed place has at least one definitely vegan dish on the menu. There also is a website with interesting stories and interviews and a facebook page. This app is useful especially in North America. It is a list of big chain restaurants and what vegans can get there according to the restaurant managements. The list has a search function. 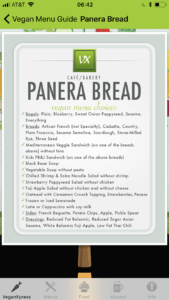 I have tried the app at Panera bread and thought it was very comfortable not to have to ask a million questions, but just pick something from the list. I chose the black bean soup and it was great. It is however always a good idea to have a look at what the places are offering, sometimes there is a new vegan dish on the menu that hasn’t made it into the app yet or a regional variety, and then please inform veganxpress about interesting findings 🙂 This app also offers lists of snacks and sweets and condiments you can buy in shops and a list of alcoholic beverages. There is no search function for these things though. This is a list of airports and how vegan-friendly they are. A very good idea, but I think this app still needs some work. Berlin is not listed at all, Munich is, but the information is old, so this app needs our help. 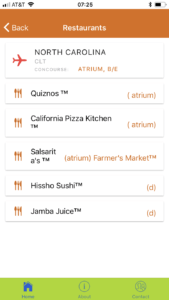 It was useful for finding out that there is a California Pizza Kitchen at Charlotte Airport and where, and my veganxpress app showed what I can get there. So no walking around forever looking for food. By the way, the airports are listet by countries, not cities or 3-letter-codes, so to see what your options are at Charlotte Airport, you need to search for “North Carolina”. 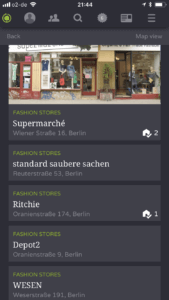 Finding a green hotel, restaurant, shop oder service is easy with this still quite new app: In the picture I searched for fashion stores in Berlin. The treeday index shows the sustainability of businesses on a scale from 0 to 100, and you can also track your own lifestyle’s sustainability in your profile. 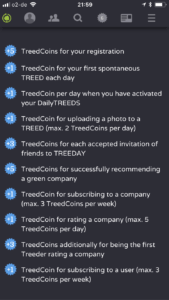 And what’s more, the user can earn “treedcoins” for various activities and redeem them for products and services with the partners. This way you can help improve the app and keep it up to date, and in return you get interesting vouchers. 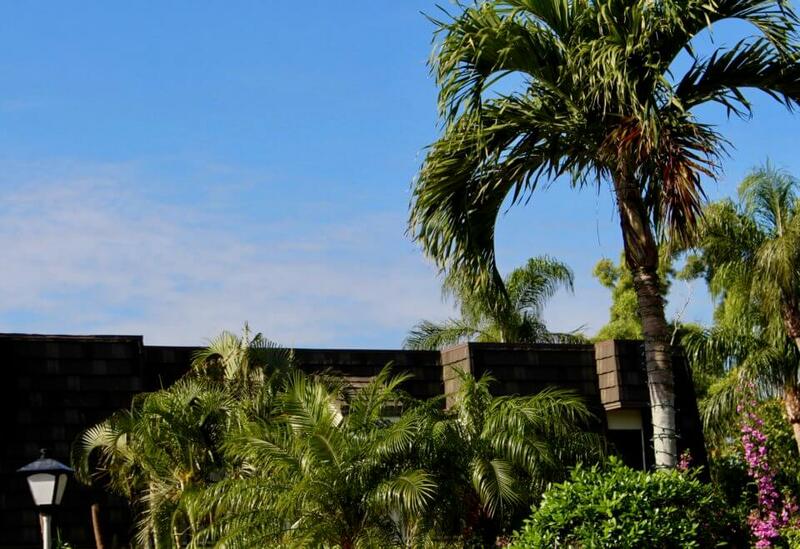 A hotel voucher maybe, or my favorite: you can have a chocolate tree planted in Peru! I have already started “treeding” for my chocolate tree. Both of these apps have a search function and get their data from Barnivore.com, so you can find out which drinks are an option in no time. 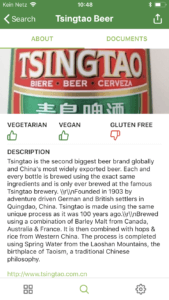 Veggiebeers has only beer and wine, no liquors. 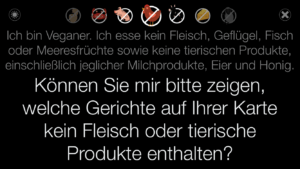 This app shows the usual questions in many languages, professionally translated. Very useful in countries where you can’t communicate very well. There also are pictures and Veganagogo even has a night mode. Very useful, not just for vegans checking ingredients. Wondering what that important looking sign with the exclamation mark says? Might be interesting and google translate can often be helpful! Just type in the text, take a picture or ask the person to speak into your phone and the translation appears. Of course it’s not always a perfect translation, but it usually gets you further. You can also download a language and use the app offline. 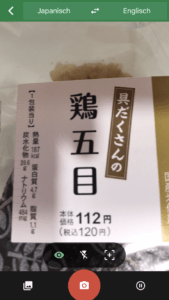 Like I did in Tokyo: and it told me all I needed to know when looking for onigiri. I found a good and quick tutorial how to use it here. One of the things I like best about traveling is discovering the local cuisine. And a great way to do that is taking a cooking class. 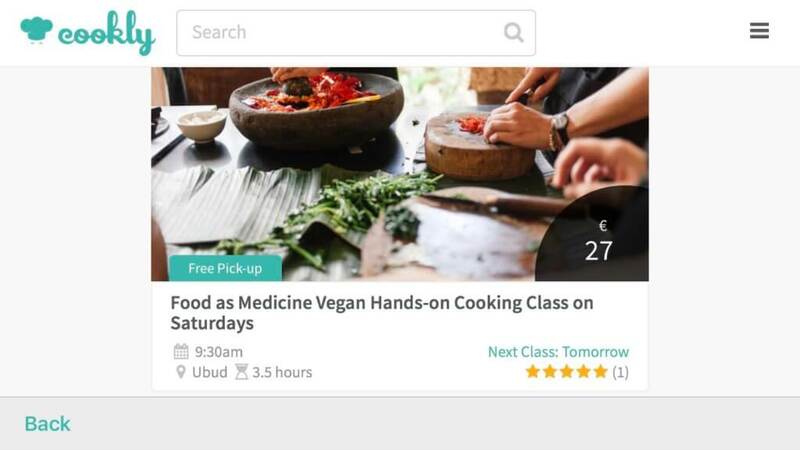 With this app, you can type “vegan” in the search bar and even sign up for classes right away. Should you offer cooking classes in your city you can put them up in this app, too. Sometimes you just want to know the nearest place to get a coffee with plant milk. That is why these apps are gold. If you stay somewhere for longer, look for an app for that city. If there is no such app, you could join a facebook group. In most places there is a vegan community interested in exchange and happy to assist. Thanks to google translate the language barrier doesn’t have to be an obstacle anymore. And there’s no app yet, but the website AirKitchen Plus is super interesting for those traveling to Japan. Here you can find vegan Japanese food cooked and served in private homes and also cooking classes. Do you like this post? You can pin it on Pinterest by clicking on the red p-button below. 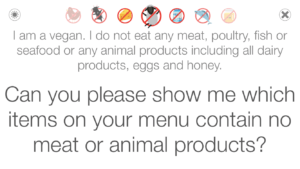 And have a look at my VEGAN TRAVELING BOARD if you like.